Our Tie-down kit is suitable not only for JumpKing Trampolines, but for all circular trampolines we sell. 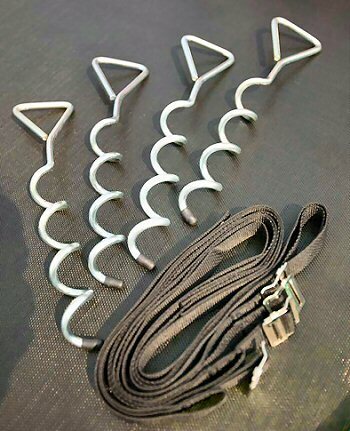 Our Tie-Down kit comprises 4 galvanised rust-free Ground Anchors and the 4 heavy-duty anchor straps. JumpKing is, quite simply, the largest trampoline manufacturer in the world and have been manufacturing trampolines for over 20 years, gaining unrivalled experience in the trampoline market. These adult and childrens trampolines come in a variety of sizes and styles to suit every garden and budget. With millions sold worldwide, every Jumpking trampoline is manufactured to US (ASTM) and EU (TUV) standards.